The Fisher Space Pen is the quintessential write-anywhere ballpoint pen that most people have seen or might own. There are several other pens that utilize a pressurized cartridge to achieve the same results, and the one that I've really taken a liking to is the Uni Power Tank. There are three things that stand out to me that make the Power Tank a greater value than the Space Pen: Price, Grip, and Writing Performance. Bold claims, right? At $3.30, the price is obviously much lower than most Fisher Space Pens. 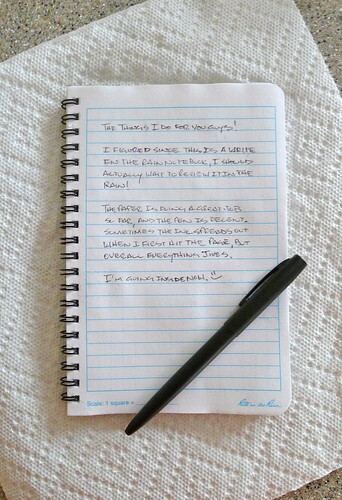 But, the price doesn't detract from the writing quality of the pen, which is what makes it a great value. I have several of these in different places. There's one in each of our cars, a couple in random bags of mine, one at work, and probably a couple others that I've forgotten. I can buy several and not flinch. The grip on these pens is something I especially enjoy. The grip section sports tightly grouped grooves that provide an excellent writing grip. The thickness of the section is also very agreeable. It's on the thick side of average. I've written a lot with these pens, and I've never been annoyed by the grip. The refill is excellent as far as ballpoints go. I don't think it uses the same ink technology as the Jetstreams, but it's pretty similar. Smooth, dark, and skipless. This pen keeps up with fast writing in less-than-ideal conditions and positions. On top of that, it's a 0.7 mm point, which is what I prefer. It's the same line width as the Jetstream 0.7 mm points. Prefer something different? You can also get 0.5 and 1.0 refills, although color options in all are bare. One of my favorite things about this pen when compared to something like the Fisher Bullet is the fact that it's retractable. Sure, it's longer than the Bullet when it's closed, but you can't beat the simple one-handed operation of a retractable pen. This pen is a real winner for me because it significantly over-delivers on what it sets out to do. It's trustworthy, and I love it for that. There are five colors to pick from, as well as a premium metal body that's only available in pink on JetPens. They used to carry a silver and black version, and I wish I would've gotten one when I had the chance. The body colors are extremely exciting, but there's plenty of choice. Personally, I think you can't go wrong with the Yellow or Silver bodies. Posted on July 9, 2014 by Jeff Abbott and filed under Pen Reviews, Uni-Ball, Power Tank. Over the years, I have reviewed all of the Uni-ball Power Tank pens that I could get my hands on: the Original, the Smart Series, and the Smart Series High Grade. I had no idea there was an Eco version until my friend Carmen brought one back from Spain and sent it my way. My first reaction: Wow, that is one ugly pen! I understand that Uni is going for the eco-friendly look but I’m not sure they pulled it off here. It actually doesn’t look so bad in the picture, but in person it comes off as odd. The brown grip area is what gets me. It is lighter than the brown plastic clip, and grip wear shows up even lighter. That makes for a worn down looking grip before it has had much use. While it may not win any beauty contests, it is still a decent pen. The blue 1.0 mm pressurized ink cartridge is smooth and dark. The line does have a good amount of white space in it, which is a flaw seen in many ballpoints. I have had more success writing with the 0.7 mm Power Tanks, so that would be my preferred Eco option as well. The Power Tank line is a great choice if you are looking for a pressurized ballpoint pen. Just know that there are several barrel options, ink sizes, and ink colors to choose from. 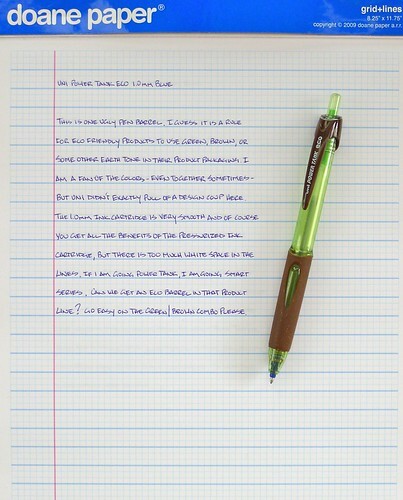 Posted on March 14, 2012 by Brad Dowdy and filed under Pen Reviews, Power Tank, Uni-Ball. 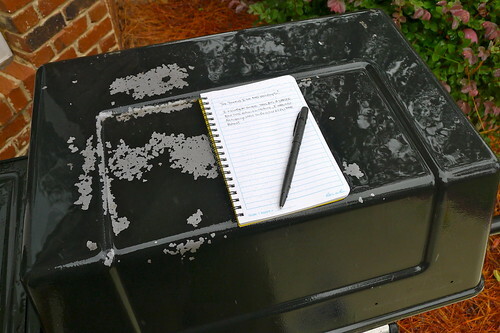 I have been wanting to review a Rite in the Rain notebook ever since I reviewed the Apica Rain Guard a couple of years ago. I also wanted to be sure to give the Rite in the Rain a proper review since I just dripped some water on the Apica to test it out. Well, there was a big rainstorm at my house last week, so the review was on! I donned my hooded rain jacket at marched outside with my Outdoor Journal and Tactical Pen that I ordered from Hickorees. I wasn’t quite sure where I was going to be able to write and take pictures, but I quickly realized that my grill was the perfect spot. It wasn’t a monsoon outside, but the rain was steady. I tried to take a few in progress photos show how wet the page was getting and how the pen was performing. The paper did great. It was soaked but it hung tough. The spot where my hand was resting on the journal soaked through more due to the pressure, but it held up fine. The pen has a Fisher Space pressurized refill, and it did a good job overall. The one issue that you can pick up in some of the photos is that if the ink blobbed at the tip (like a normal ballpoint would) it would spread out a bit in the water. That happened regularly as I lifted the pen off the page and put it back down to write. Once I went inside, I wiped down the journal with a paper towel. The ink didn’t smudge, and the paper dried quickly. 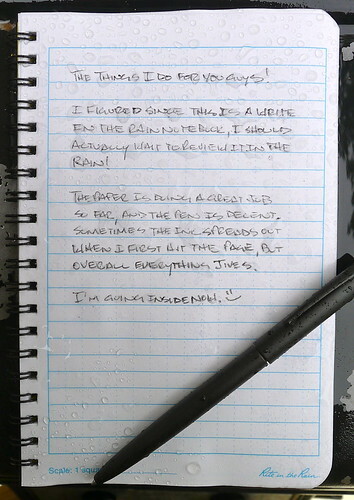 It was a very impressive performance by the Rite in the Rain Journal. The pen did well, but if I had planned more I would have tested a Uni-Ball Power Tank and Tombow Airpress for comparison. I think they would have done even better since they write cleaner to begin with. I was just too soaked to go back inside and get them. I am not a hunter, fisherman, logger, construction worker, or any other vocation that this journal is targeted to, but I can’t imagine another paper product that would perform as well as this one. Posted on October 17, 2011 by Brad Dowdy and filed under AirPress, Apica, Fisher Space Pen, Pen Reviews, Power Tank, Rite in the Rain, Tombow, Uni-Ball.